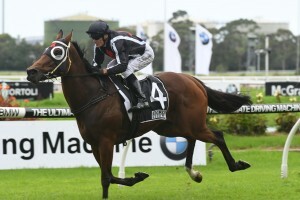 Trainer Mick Bell is set to back up his mudlark Jungle Edge despite the seven year old being lumped with 63.5kg in the $100,000 Stabil-Lime Group Handicap (1200m) at Racing.com Park at Pakenham on Saturday. Jungle Edge, above, has been lumped with 63.5kg for the Stabil-Lime Group Handicap at Pakenham. Photo by Steve Hart. All of Jungle Edge’s thirteen wins have been on rain affected track and with the Pakenham track rated a heavy 8 at this stage in the week with more rain expected, Bell is reluctant to pass up another opportunity to run his stable star on wet surface. “He’s a 109-rater so he’s earned his weight,” Bell told racing.com. Jungle Edge heads up the twenty-seven nominations for the Stabil-Lime Group Handicap and will be chasing a hat trick of wins following his victories in the Group 3 $150,000 Kevin Heffernan Stakes (1300m) at Sandown November 18 and in the $100,000 Le Pines Funerals Handicap (1000m) on the Ladbrokes Park Hillside track at Sandown last Saturday. Jungle Edge was handicapped with 62kg last start in the Le Pines Funerals Handicap but his weight was reduce to 59kg courtesy of apprentice Georgina Cartwright’s 3kg claim. The noted wet tracker was in fine form during the Sydney Autumn Carnival when he found a heavy 9 rated track at Rosehill for his win in the Group 3 $150,000 E-Group Security Star Kingdom Stakes (1200m) at Rosehill and then three starts later led all of the way on a heavy 8 rated track to claim the Group 3 $125,000 Taxibox BRC Sprint (1350m) at Doomben during the Brisbane Winter Carnival.